Yes I know. I’ve been conspicuous by my absence. Sorry about that. 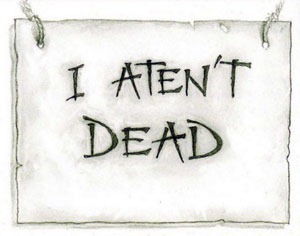 However, I’m still here and as Granny Weatherwax would say, I aten’t dead. I have moved house and been without broadband. Speaking of which, did you know that if you phone the Priory and tell them that you need help because it’s been two weeks, three days, four hours and twelve minutes without adequate internet access and you need their help, they laugh themselves into a coma? No, neither did I until recently. I don’t know, the quality of care is deplorable these days. Anyway, I’m here. I’m wading through my collection of unanswered emails and I’ll be updating my site sometime over the next few days. Incidentally, isn’t it just typical that my email had been very quiet in the couple of weeks before I moved, but as soon as I would have trouble answering it, it went mad. If you have sent me an email over the last couple of weeks and not had a reply, please let me know. I’m currently only available for a limited number of outcalls in the Inverness area, so if that is what you’re after, just let me know and I’ll see what I can do. This entry was posted in News, Ramblings and tagged Broadband, email, Inverness, Moving house on July 23, 2011 by Amanda.